I'm really looking forward to the films based on Cassandra Clare's The Mortal Instruments series. The first film, City of Bones, is wrapping up filming early this month. And MTV did a little featurette with some of the cast, including leads Lily Collins and Jamie Campbell Bower (who I liked in Camelot and who is one of the Volturi, Caius, in the Twilight movies). The film adaptation of James Patterson's Maximum Ride is set to begin pre-production. The film is tentatively scheduled for a 2014 release. Read more here. Unraveling by Elizabeth Norris is being adapted to television by MTV. Read more here. I haven't read this but it sounds interesting. According to the Deal Report in Entertainment Weekly, Shailene Woodley (The Descendants, Secret Life of the American Teenager) is in talks to star in the film version of Veronica Roth's popular Divergent. And unless you've not been plugged in at all lately, you know we're a mere six days away from the final film in the Twilight saga, Breaking Dawn, Part 2, hitting U.S. theaters. I know this series has its haters, but I'm looking forward to seeing the movie. Prior to C.J. 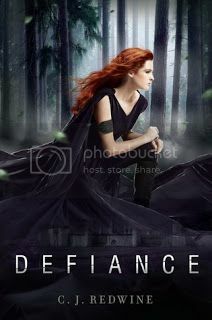 Redwine's debut young adult novel, Defiance, hitting shelves in late August, I'd been waiting (rather impatiently, I might add) to be able to read it. C.J. is a friend in my local RWA chapter, but she's also a great writer. From the time I heard about the book's premise, it sounded like it was totally my kind of read. And then I saw the beautiful cover and got even more excited. I mentally crossed my fingers when I finally was able to start reading it, hoping I would love it as much as I wanted to. There is no worse feeling than not liking the book of someone you know. But no worries here. I loved Defiance and am already rather impatiently waiting for the second installment. Defiance is the story of Rachel Adams, who lives in a world divided into walled city-states with the vast Wasteland between them. The Wasteland is filled with dangers, including a giant, serpent-like creature that lives underground called the Cursed One. But living in her town of Baalboden isn't perfect either. The town's leader, called the Commander, has absolute authority and isn't afraid to use it to get what he wants, and what he wants is whatever package Rachel's father, a courier between the cities, had when he went missing. As if not knowing if her father is alive or dead isn't bad enough, when her father goes missing, Rachel is assigned another male Protector, which every female in Baalboden must have when she leaves her home. And that new Protector is Logan McEntire, the guy she'd once professed her love for and got none in return. Unfortunately, her anger at this turn of events and the embarrassment she feels around Logan are the least of her problems, because the Commander has no problem forcing her to do what he wants (find her father and the package). She has to face loss, the realization that Logan might have felt more for her than he claimed, and the dangers of the Wasteland. But she's every bit as determined as the Commander to get what she wants -- her father back, freedom for the two of them as well as Logan, and the Commander's head on a platter for all the evil things he's done to her and the rest of the people of Baalboden. I think the fact that so many YA books are making their way to the cinemas is going to draw more 'youngsters' to read. I'm afraid Twilight is the only series of read of the ones you mentioned but I've not seen any of the movies - maybe I'll wait until they're all out and have a marathon lol. I've enjoyed Harry Potter and The Hunger Games. "I know this series has its haters, but I'm looking forward to seeing the movie." On a totally separate note, I know you're a fan of The Walking Dead and my husband and I have recently gotten hooked! We've watched season one and are making our way through season two, while watching season three on Sunday nights. GREAT show!! I'm taking in a Twilight Marathon on the 15th at the movie theater. All 5 movies in a row. Think I am going to sneak in a sandwich... :) So can't wait. The Maximum Ride books sound great. I haven't seen them before, so am going to have to check them out. Thanks for sharing this. I also think I'll grab a copy of Defiance. You caught my attention with the review.